You, Shared. A look behind the scenes. Hello! You may have noticed Pear Tree Greetings’ full page ad in the December issues of Real Simple Magazine, Woman’s Day, O Magazine and Southern Living. Personally, I wonder about magazines ads, what went behind it, what was the thinking, why this particular message, etc. Maybe because I work in business, or maybe I’m just strange; the latter is a definite possibility. But if you are like me, sometimes you wonder. 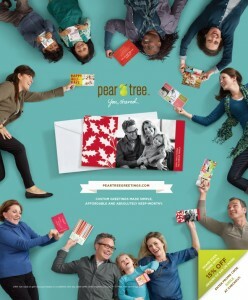 For a small company like Pear Tree Greetings, it was a big deal to run a campaign like this. Our team feels a bit like we are going to the Big-Time with a full page ad anywhere, particularly these well-known and loved magazines. So I thought I would share with you a few behind-the-scenes thoughts on the campaign and process. First, it was really fun putting the campaign together! The whole team was involved in the feedback and development. Our creative agency, Minneapolis-based Knock, Inc. was wonderful to work with – creative, smart people that we are fortunate to have as partners, and they developed the initial concepts. We wanted it to be fun, fresh, and demonstrate the excitement and pride a person has with THEIR card. And we wanted to capture the idea of people connecting with each other through cards…that those cards are a reflection of them. It’s why we love our tagline, You, Shared. When you send a holiday card, we really believe you are really sharing a part of you. It’s one of the reasons we love our business – the idea of people connecting and sharing with each other through our greetings. Once we decided on the concept, we proceeded with selecting cards to showcase, which was VERY hard. We are biased, but we love so many of our cards and it was difficult to choose which card was going to be showcased and held by each individual. The photo shoot was energetic! We wanted people in the ad that looked like real people we knew (everyone in the ad is actually a person we know), and not models walking down the runway. We wanted people wearing clothes that everyday people wear, and reflect our real customers. Our cards are accessible and we wanted people to know that we are not a company that sells beautiful designs at super-expensive prices. Our team looks at every single card that is printed, so we see that our customers are real people, sharing all different messages and photos with people they love. The adorable kids are kids we know, and they colored their kid’s coloring cards on set. The photographer was delightful – he was calm and made the day comfortable. I was amazed to watch the photographer’s skills in taking photos of children and picked up a few tips from him to use at home with my own kids. Note to self: make chocolate chip cookies readily available. Following the photo shoot, we proceeded with putting it together, choosing cards, finalizing colors and copy, etc. That process was time consuming and I appreciated all the work that went into getting all the details right, including coordinating with the printers, the designers, and getting the final artwork to the magazines two months before the magazines come out. For the past 2 months we have been anxiously waiting to see it in actual print on the newsstands. It’s here! What do you think of it? We would love to hear your feedback. Please email me at liwanag@peartreegreetings.com, and have a wonderful day!